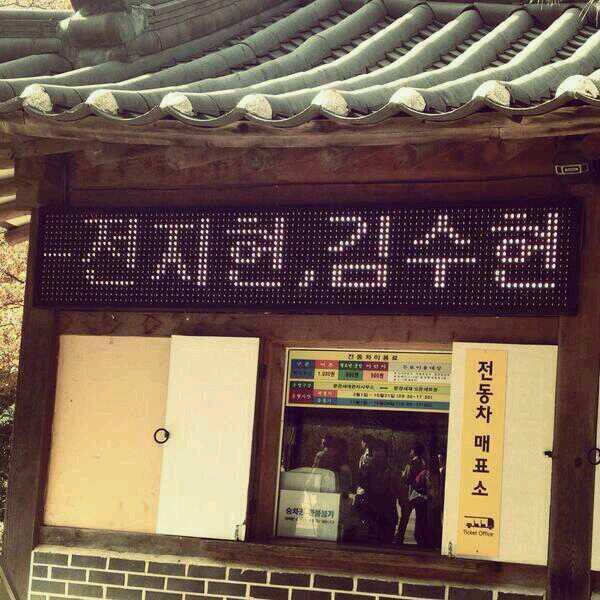 Does that mean no yunho afterall? Can I yell yay already? Upcoming SBS drama ‘You Came From The Stars’ released photos from its first script reading. On October 14th, the cast gathered in SBS Ilsan Production Center, Gyeonggi Province. In attendance were Kim Soo Hyun, Jun Ji Hyun, Yoo In Na, Park Hae Jin, Kim Chang Hwan, Na Young Hee, Lee Il Hwa, Jo Hee Bong and were also participated by writer Park Ji Eun and director Jang Tae Yoo. Earlier on that day, Jun Ji Hyun appeared like a goddess with her fashion style and youthful appeal. 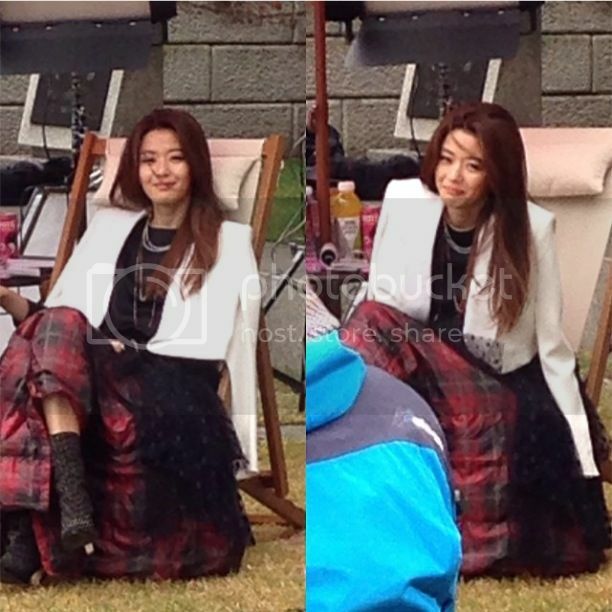 She is perfect for the role of Hallyu actress Cheon Song Yi. Kim Soo Hyun also visited the location and greeted his senior actors. 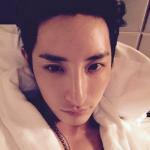 He made a thorough preparation for his role as Do Min Jun, the alien man who lived 400 years on earth. To be broadcasted after the conclusion of ‘The Heirs’. 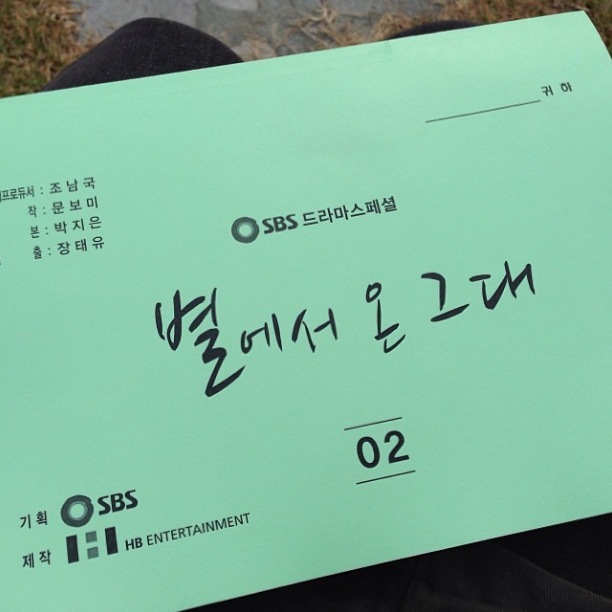 “My Lover From The Stars” has revealed its script reading session. The upcoming SBS Wednesday/Thursday drama “My Lover From The Stars,” which has been a hot topic due to its dazzling cast, has held its first script reading. 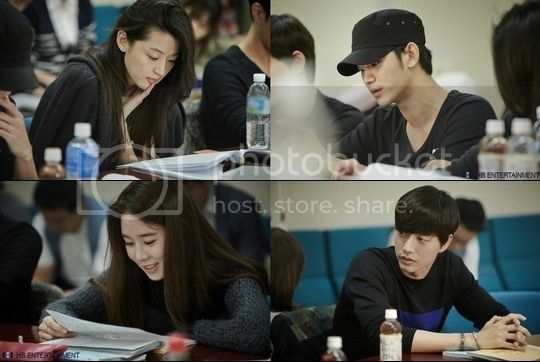 The script reading photos have been revealed on November 4 and shows the cast members including Jeon Ji Hyun, Kim Soo Hyun, Park Hae Jin, Yoo In Na, Yoo In Young, Ahn Jae Hyun, Kim Chang Wan, Na Young Hee, Lee Il Hwa and Jo Hee Bong. According to sources, Jeon Ji Hyun, who plays the Hallyu star Chun Song Yi, perfectly got into character with a bright energy. Kim Soo Hyun showed that he prepared a lot for the session as he completely absorbed his script already, portraying the alien from another world, Do Min Joon. These two actors are predicted to be this winter’s best visual and chemistry-laden, rom-com couple through the drama. Other cast members Park Hae Jin, Yoo In Young and Yoo In Na also got into character, showing their passion and hard work for this project. Veteran actors such as Kim Chang Wan, Na Young Hee, Lee Il Hwa and Jo Hee Bong showed their strong presence with their experience, upgrading the drama’s quality. Jeon Ji Hyun’s fashion on this day also garnered a lot of attention. Her casual and effortlessly fashionable autumn outfit as well as her amazing body-line and proportions are becoming quite a hot topic. “My Lover From The Stars” is set to air in December. We finally get our first look at the cast of You Came from the Stars (formerly known as “Man from Another Star” or “Man from the Stars”), which actually held its first script reading on October 14th at the SBS Tanhyeon Production Center. Kim Soo Hyun, Jeon Ji Hyun, Park Hae Jin, Yoo In Na and a number of familiar supporting actors (Kim Chang Wan, Na Young Hee, Lee Il Hwa, Yoo In Young, Ahn Jae Hyun, Jo Hee Bong) were in attendance. I don’t see Yunho of DBSK anywhere, so perhaps that casting fell through after all? DBSK Yunho is out! actor Choi Min will play the role of Jun Ji Hyun (Cheon Song Yi) fiance. Hmmm need to read official news about yunho is out. A friend of mine said hr id not replace yunho. Another role? Was Choi Min one of the 3 young cooks in Pasta? Please, no Yunho no Yunho. I doubt he or his company would want any role smaller than this anyway. Dont worry. Its comfirmed that choi min is fiance. Smiling like a loony right now!!!!! I just can't wait! Give me some SooHyun RIGHT NOW!!! !